Two weeks ago, I bumped into Peter Capaldi at a literary festival and asked what he was up to. He said he was filming the role of Cardinal Richelieu in a BBC version of The Three Musketeers and then planned a holiday after the 10-month shoot before taking on "one very specific thing" in television. He made that commitment sound very small and casual, which shows both what a clever actor he is and the fanaticism with which the BBC was protecting the identity of the performer code-named Houdini until last night. Over the past five decades, the identity of the next actor to play the Doctor has moved from being announced in press releases and then at press conferences to becoming one of those jobs others include prime minister, England football captain and winner of Britain's Got Talent - declared live on television. This galloping inflation of revelation is partly due to generally increased hysteria in media, but also reflects the rise in the time-travel drama's profile since it returned to BBC1 in 2005. The role of the Time Lord has graduated from solid character actors - including the Bakers, Tom and Colin, and Sylvester McCoy to attracting the sort of performers who play Hamlet on stage, such as Christopher Eccleston and David Tennant. Older than recent incumbents, at 55, but continuing a Scottish casting spread after Tennant and McCoy, Capaldi has stage experience but is most celebrated for his screen work. His primary quality as an actor is danger; during his most vicious riffs as the sewer-mouthed Malcolm Tucker in The Thick of It, there frequently seemed a threat that his pulsing facial veins might burst. He was also memorably menacing as the new boss in the TV newsroom drama The Hour. In that sense, Capaldi might have seemed more natural casting for the Time Lord's nemesis, the Master. So the main interest in his portrayal of the Doctor will be whether show-runner Steven Moffat - who has previously cast the actor in supporting roles in both Doctor Who and the spin-off Torchwood - encourages him to maintain his signature screen-bursting energy or explore a gentler part of his range. As Capaldi is not only in demand as an actor but also writes and directs, he is giving up a significant amount to fulfil the show's brutal shooting schedules in Cardiff. His casting confirms that, like James Bond, the Doctor has become a role serious actors are happy to take on. Given the rules of regeneration theoretically permit the Doctor to become anyone, many may regret there has been no change of race or gender - although, following recent misogynist attacks online, female actors may be relieved to have avoided becoming a test for the limits of Twitter tolerance. But, so years on, the speculation of recent weeks and the lavish peak-time unveiling last night have proved the show's title remarkably prophetic: millions want to know the Doctor's identity. Now the questions start about whether Capaldi can bring singularity to a role that has had 11 previous owners. APA 6th ed. : Lawson, Mark (2013-08-05). Bringing an edge of danger to the Doctor. The Guardian . MLA 7th ed. : Lawson, Mark. "Bringing an edge of danger to the Doctor." The Guardian [add city] 2013-08-05. Print. Turabian: Lawson, Mark. "Bringing an edge of danger to the Doctor." 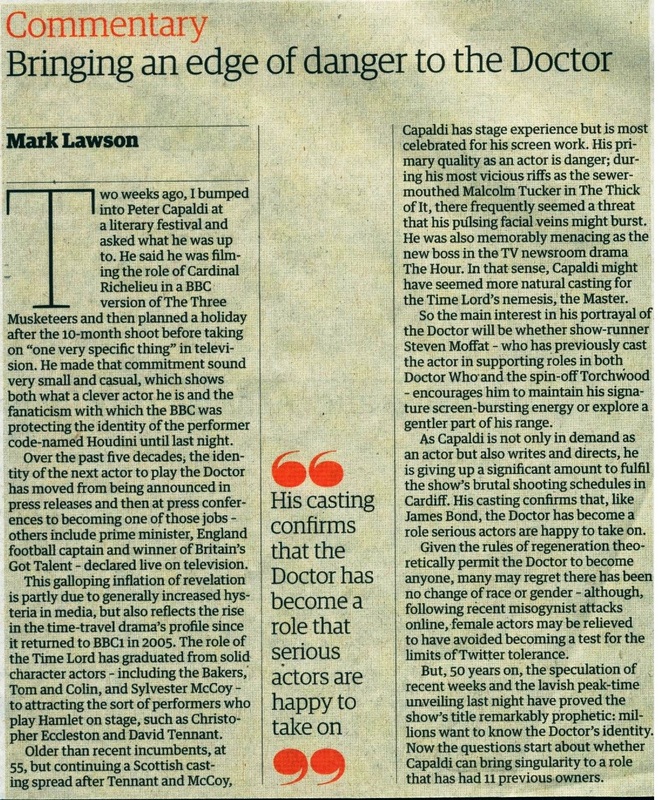 The Guardian, 2013-08-05, section, edition. This page was last modified on 11 February 2016, at 23:39.